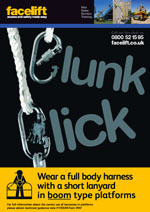 Facelift Safety Harness Poster will show on screen for download and we will email you a copy. Please download, print and place in your site office. We can provide IPAF Operator training and Harness user inspection training, please see the training section for more information, or call our training section directly on 01444 88 11 66.